To understand your Azure bill, compare your invoice with the detailed daily usage file and the cost management reports in the Azure portal. This article doesn't apply to Azure customers with an Enterprise Agreement (EA customers). If you're an EA customer, see Understand your bill for Azure customers with an Enterprise Agreement. This article doesn't apply to Azure customers with a Microsoft Customer Agreement. If you have a billing account for a Microsoft Customer Agreement, see Understand the Azure charges on your Microsoft Customer Agreement invoice. For an explanation of how billing works in the Azure Cloud Solution Provider (Azure CSP) program, including the billing cycle, pricing, and usage, see Azure CSP Billing Overview. 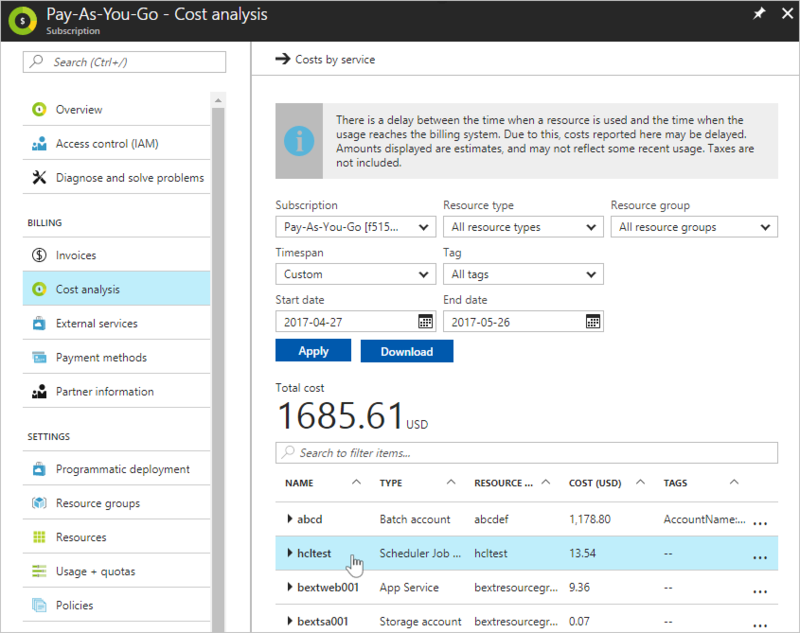 If there's a charge on your invoice that you want more information about, you can compare usage and costs with the usage file or with the Azure portal. The detailed usage CSV file shows your charges by billing period and daily usage. To get the file, see Get your Azure billing invoice and daily usage data. Your usage charges are displayed at the meter level. The following terms mean the same thing in both the invoice and the detailed usage file. For example, the billing cycle on the invoice is the same as the billing period shown in the detailed usage file. The Usage Charges section of your invoice has the total value for each meter that was consumed during your billing period. For example, the following screenshot shows a usage charge for the Azure Scheduler service. The Statement section of your detailed usage CSV shows the same charge. Both the Consumed amount and Value match the invoice. To see a daily breakdown of this charge, go to the Daily Usage section of the CSV. Filter for Scheduler under Meter Category. You can see which days the meter was used and how much was consumed. The Resource and Resource group information is also listed for comparison. The Consumed values should add up to what's shown on the invoice. To get the cost per day, multiply the Consumed amounts with the Rate value from the Statement section. The Azure portal can also help you verify your charges. To get a quick overview of your invoiced usage and charges, view the cost management charts. In the Azure portal, go to Subscriptions. Select your subscription > Cost analysis. To continue the previous example, you see a usage charge for the Azure Scheduler service. To learn more, see Prevent unexpected costs with Azure billing and cost management. External services, or marketplace charges, are for resources that have been created by third-party software vendors. Those resources are available for use from the Azure marketplace. For example, a Barracuda Firewall is an Azure marketplace resource offered by a third-party. All charges for the firewall and its corresponding meters appear as external service charges. External service charges are billed separately. The charges don't show up on your Azure invoice. To learn more, see Understand your Azure external service charges. Azure doesn't directly bill based on the resource cost. Charges for a resource are calculated by using one or more meters. Meters are used to track a resource’s usage throughout its lifetime. These meters are then used to calculate the bill. For example, when you create a single Azure resource, like a virtual machine, it has one or more meter instances created. Meters are used to track the usage of the resource over time. Each meter emits usage records that are used by Azure to calculate the bill. When the VM is created, each meter begins emitting usage records. This usage and the meter's price is tracked in the Azure metering system. If you set up a credit card or a debit card as your payment method, the payment is charged automatically within 10 days after the billing period ends. On your credit card statement, the line item would say MSFT Azure. To change the credit or debit card that's charged, see Add, update, or remove a credit or debit card for Azure. If you pay by invoice, send your payment to the location listed at the bottom of your invoice. To check the status of your payment, create a support ticket. 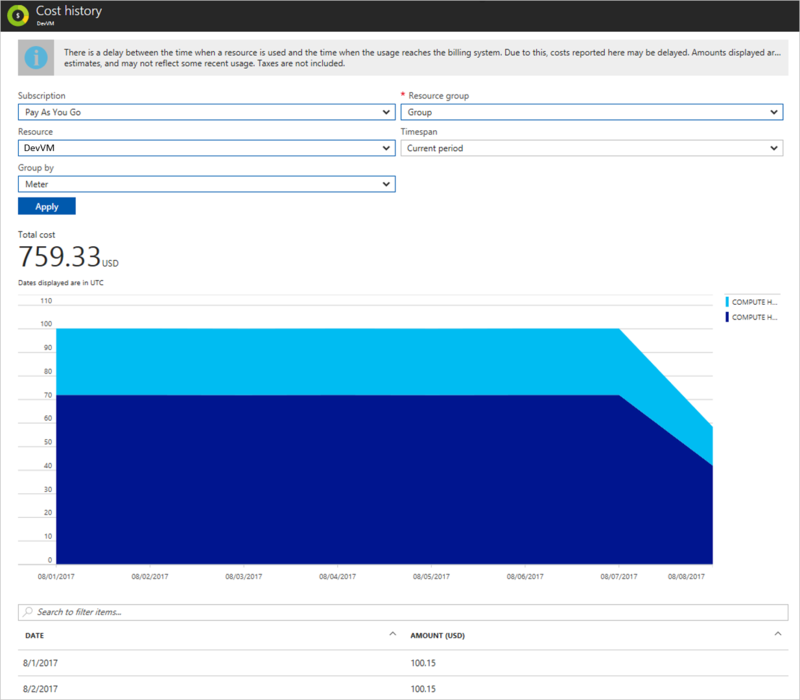 Review your usage and costs regularly in the Azure portal.